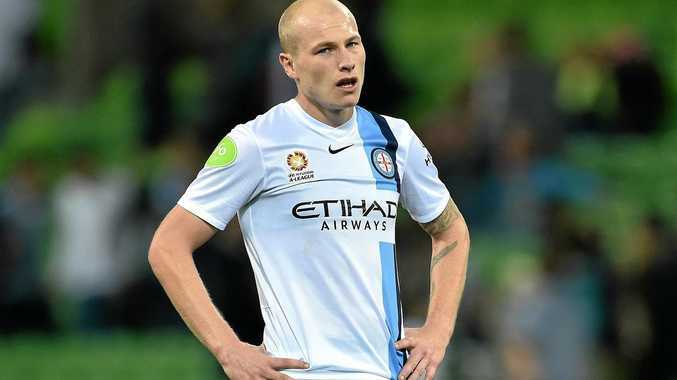 AARON Mooy fever has reached a new level thanks to Pep Guardiola's very glowing public endorsement of the Socceroo last week. While Mooy's Huddersfield Town held Manchester City to a 0-0 draw in their FA Cup clash on the weekend, forcing a replay, plenty of the club's fans wondered "what if" had their Australian star been allowed to play by his English Premier League parent club. There's been plenty of talk over whether Mooy will graduate and become a squad member of the Premier League powerhouse, with Guardiola indicating a decision will be made at season's end. Mooy has responded to Guardiola's glowing praise, telling Huddersfield's official website: "It's obviously excellent and I'm very humbled and all that sort of stuff. "It's great to know he's watching me and has his eye on how I'm doing, that's great." Before the weekend tie, The Manchester Evening News ran a story about Mooy headlined "The midfielder who could save Pep Guardiola and Man City a fortune this summer". His teammate Philip Billing added to the sentiment. "From what I've seen, he is such a good footballer," said the Danish midfielder. "He's probably the best loan player the club has had for a long time. "He's definitely got the quality to play in the Premier League. "Watching him in training you learn. He's so calm on the ball. "I try to watch him play because you learn from players like that." Indeed, before the tie, much of the focus was on Mooy. In the local paper, The Huddersfield Examiner, Blake Welton wrote: "It is little wonder Guardiola looked into recalling Mooy from his Huddersfield Town loan during the January transfer window, having been impressed by displays that, though less refined, have a passing similarity to master technicians such as Xavi and Iniesta. "Both footballing legends played under Guardiola at Barcelona and there is no doubt Mooy will be given the opportunity to prove himself on Manchester City's pre-season tour ahead of the 2017-18 season."